With 153 years of experience serving Amsterdam’s youngest population, Emma Children’s Hospital, a part of the Amsterdam University Medical Center (UMC), continues to strive for medical excellence. Fifteen years ago, a strong focus on their philosophy that every child deserves the best possible care, no matter their illness, started Emma Children’s down a path of transformations. It most recently led them to Apple technology. Together with Jamf and Jamf Certified Managed Service Provider (MSP), CareServant, Emma Children's is providing iPad devices in each room of their teenagers ward as a way to help improve the overall hospital experience. 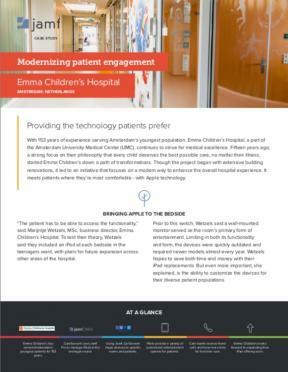 Read the full story to see how Emma Children's Hospital is using technology to modernize patient engagement.